3 Star Wars Live-Action Netflix Series Planned? With just under five months until Star Wars: The Force Awakens hits theaters this December, the animated TV series Star Wars Rebels returning for Season 2 this fall, and a slew of Star Wars books arriving in September, fans will be spending a lot of time in a galaxy far, far away in the latter half of this year. Back in March, a report surfaced that claimed LucasFilm is developing a live-action Star Wars TV series, but we haven't heard anything about the project since then. 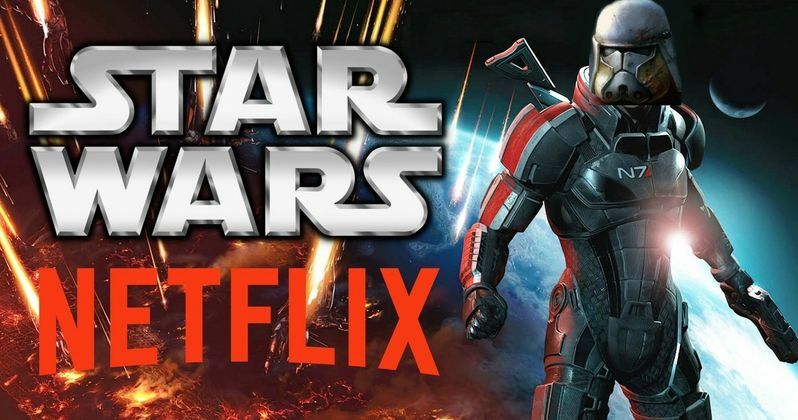 A new report from Cinelinx claims that Disney and LucasFilm are actually developing three separate live-action TV shows with Netflix, in a deal that is said to be similar to Marvel's four superhero TV shows on the streaming service. Unfortunately, no details were given about the shows themselves, or where they may be situated within the Star Wars universe. The report did "guess," though, that the shows may debut in 2017, which would coincide with the release of Star Wars: Episode VIII on May 26, 2017. Along with the four Marvel TV shows, Marvel's Daredevil, Marvel's A.K.A. Jessica Jones, Marvel's Luke Cage and Marvel's Iron Fist, Disney's Star Wars: The Clone Wars aired its final season on Netflix. The Star Wars universe is bigger than ever, with the new movie trilogy, the stand alone movies Star Wars Anthology: Rogue One and Star Wars Anthology: Han Solo Movie, the upcoming books, and TV shows Star Wars Rebels and the upcoming Lego Star Wars: Droid Tales. Star Wars Rebels is set between Star Wars: Episode III - Revenge of the Sith and Star Wars: Episode IV - A New Hope, which is also when Star Wars Anthology: Rogue One is set. Since it is a 30 year time gap, it's possible that these new shows could also be set in this timeline, but we'll have to wait and see. When the earlier report from March surfaced about the first live-action series, it was rumored that ABC would be the show's home, since Disney owns the network. But it's easy to see why Disney and LucasFilm would want to develop their shows on the streaming service, given its massive success over the past few years. The earlier report also revealed that the series would shoot in between the movies, so Disney could utilize the same sets. That may still be the case, but we'll have to see how Netflix and LucasFilm plan to release this series, if they are in fact happening. Are you looking forward to three live-action Star Wars shows? Are there any stories or characters you think would be served best by a weekly TV series, instead of movies? Let us know what you think, and stay tuned for more Star Wars updates as soon as they come in.